Okay, so the Fed had to bailout the too big to fail banks back in 2008, right? For the moment we'll ignore the fact that 3 years later those banks are roughly 20% larger and taking on even more risk. This is definitely one bailout that makes you say, hmmm?!?! The bank, then 29 percent-owned by the Libyan state, drew $1.1 billion from the Fed’s so-called discount window in October 2008, Including $450 million during the week when hundreds of financial firms drew a record amount of emergency funding from the U.S lending program, according to data released by the Fed today. Arab Banking Corp. also owed about $4 billion to the Fed under other bailout programs in the fall of 2009, data released in December show. The U.S. government has since frozen assets linked to the regime of Libyan ruler Muammar Qaddafi and engaged in air strikes against his military forces as they battle a rebel uprising in the North African country. Arab Banking Corp. received an exemption that allows the firm to continue operating while prohibiting it from engaging in any transactions with the government of Libya, according to the Treasury Department.Libya’s stake in Manama, Bahrain-based Arab Banking Corp. increased to 59 percent in December 2010, the company said on Dec. 2." Stat of the day:€ Twitter says they have 175 million users, rumors around the web say that it's more like 10-20 million users. Hmmm, how many billion do they think they are worth? Today's initial unemployment claims were a little worse than expected at 388k (but still below the 400k number) but you wouldn't know it by reading the headlines today. Initial claims fall 6,000 - screams a headline on Bloomberg. Claims fall more than expected - shouts a CNBC headline. Here's the problem though, last week the reported number was 382,000 initial claims so claims went up last week right? Nope, last week's data was revised higher by 12,000 claims to 394,000 so while it's technically true that the number of claims fell from last week to this week the total number of claims grew meaningfully but you wouldn't know that if you just breezed through the headlines. I guess if the jobs number tomorrow is light we'll have to blame it on those torrential rain storms that hit the US in March :) ************************************************************* The first meaningful measure of Japanese economic data - the purchasing managers index - tumbled to it's lowest levels since April 2009 (at the bottom of the recession). I've been stunned by the way the global markets have shrugged off the potential impact of the 3rd largest economy in the world entering lock down mode. There was a great clip from a Nova special last night on the major highway connecting Fukushima to Tokyo. There wasn't a car on the road and that will have a ripple effect throughout the global economy. *************************************************************** The European Central Bank has decided not to come to the rescue of the Irish banks and that is sending ripples throughout the global credit markets today. There is talk of large bond selling in France and Italy. Something else to keep our eye on. *************************************************************** Finally, is this a sign of market strength or a sign of the top? Prada to file for IPO with a $10.7 billion valuation. Considering that Japan accounts for 24% of GLOBAL luxury goods sales (more than China, more than the middle east, more than Europe, more than North America) I think this might be a challenging time to sell stock in a luxury goods maker. Cheers! Sorry about the weird formatting. It's too late to try to fix it. Enjoy! Keeping with the "Weird Science" theme consider this new artificial leaf that's coming out of MIT. "The device is an advanced solar cell, no bigger than a typical playing card, which is left floating in a pool of water. Then, much like a natural leaf, it uses sunlight to split the water into its two core components, oxygen and hydrogen, which are stored in a fuel cell to be used when producing electricity. Nocera's leaf is stable -- operating continuously for at least 45 hours without a drop in activity in preliminary tests -- and made of widely available, inexpensive materials -- like silicon, electronics and chemical catalysts. It's also powerful, as much as ten times more efficient at carrying out photosynthesis than a natural leaf. With a single gallon of water, Nocera says, the chip could produce enough electricity to power a house in a developing country for an entire day." This sounds a bit like those mag-lev train articles that pop up in Popular Mechanics every 5 years but I know there has been a good deal of research going into this field over the past 10 years so hopefully this is a step in the right direction. It doesn't really address the fact that our leaves would be frozen in a block of ice for 7 months of the year in NNY but I guess we'll cross that bridge when we get to it. *************************************************************** Priorities? Top viewed stories on CNN: Parents sue over photos of dead daughter Sources: Bullet put hole in plane in N.C. Eagle ray pins woman in boat Mega Millions winner claims ticket Top viewed stories on Al Jazeera: Gaddafi troops force rebels to retreat US Muslims 'face growing discrimination' Syrian cabinet resigns amid unrest Japan on 'alert' over radiation fears ********************************************************************* The market remains remarkably hard to pin down as bad economic data today (falling consumer confidence and double dip coming in housing) was met with "BUY STOCKS because that means the Fed is coming to the rescue with QE3!!" The ratio of leveraged bets in the market is at its highest levels since Spring 2007. Hmmm, how did that turn out for all of us? However, you can't underestimate the power of the Fed to intervene. Cheers! This chart won't be legible here in the blog so I'd recommend you visit the original post here. Note to self: All sushi is to be homemade from now on. Use perch in place of tuna for the foreseeable future. Ah, but Fukushima is so 48 hours ago. We've moved onto the latest North African war..... I mean, no fly zone enforcement action. Did it strike anyone else as funny that we imposed a no-fly zone and Qaddafi just switched to using tanks and ships (which obviously don't fly)? Who knows how this will play out but I can tell you that the global reaction to this action is not universally positive. The Russian comments on "non-selective use of force" have carried a fair amount of weight around the world because obviously Russia has a spectacular record defending human rights around the world. "recent data imply that the US reflation is in trouble. QEII has boosted reserves but banks continue to reduce credit, while broad money has contracted. There is material downside risk to equity valuations. Whether equities will fall further depends on how flexible and successful the Fed’s next monetary package will be. Given the risk, investors are better off watching from the sidelines." So this strategist has moved beyond speculating IF the Fed will be back to give the market it's next fix, his only question seems to be the size of the package. Wow. Sorry about the lack of posting but I assume everyone is staying up to date with the latest news in Japan. Last Friday I was concerned that things weren't as controlled at the Fukushima plants as we were being led to believe. Unfortunately, that turns out to be the right analysis and the tragedy in Japan continues to unfold in unbelievable ways. I'll note that this is the second straight global story where Al-Jazeera - yes, that Al-Jazeera - has had more timely and accurate information than any western news organization. I could understand AJE beating the BBC to a story in Libya but getting the scoop in Japan is very impressive. How long before one of our major cable providers adds AJE to the cable package? * Remember the European debt crisis? It seems trivial by comparison to the news flow of late, but Portugal is the latest country to step forward and say "we don't need no stinkin' bailout, but if you're offering we'd take it." * Qaddafi seems to have won for now. His violent and aggressive suppression of the rebellion seems to be the model across the MidEast right now (see Bahrain). Oh, and 4 NY Times reporters are missing in Libya. * The S&P 500 is now down for the year and the Dow and NASDAQ are one bad day from being in the red. Also, while we talk about a 2 year rally in stocks the reality is that we're now essentially flat since April 2010 despite kicking $400 Bil+ into the system via Fed actions. Does this set the stage for QE3? Two weeks ago, I said no way, but all bets are off now. As I read last night the Saudi's are apparently sending 1,000 troops into Bahrain to quell the Shiite rebels there. Those rebels have said that this equates to a declaration of war. Why should you care? Well, Bahrain also happens to be home to the US Navy's 5th Fleet. So imagine how this would play out in different parts of the world. Take this sentence - _________ is sending 1,000 troops into _______ where the US has a major military presence. Now insert N. Korea and S. Korea and imagine the outcome. However, when the aggressor has 20% of the world's proven oil reserves we appear to bite our tongue. This story might get lost in all of the news out of Japan today but it's one to follow closely. It seems ridiculous to be pondering the economic impact of the Japanese earthquake while the situation remains so volatile and so many lives have been lost but in today's 24/7 news cycle it's going to be a topic of discussion tomorrow. Most markets seem to be taking this terrible news in stride with the notable exception of Japan's Nikkei which is down 5%. The long-term implications economic implications for Japan are substantial. Japan's debt to GDP was already a staggering 200% and they were recently passed by the Chinese economy in terms of total output. The long road to rebuilding the northern coastal towns that were lost, repairing transportation and electric infrastructures will take a huge toll on their collective balance sheet. Perhaps the silliest piece of analysis I read over the weekend included the idea that "Japan's economic slowdown will lower global demand for oil and thus, lead to lower oil prices." Since, oil's epic run has been fueled by unrest in the Middle East and not real end demand this strikes me as silly logic. Perhaps you could argue that the Libyan revolt is being crushed and things seem calm in Saudi Arabia and Iran (though the situation remains volatile in Egypt, Bahrain and Yemen), but to argue that "all of those cars you saw washed away won't be using any oil this week" seems mistaken (not to mention heartless). *** Update on Bahrain. There is talk that Saudi Arabia might now be willing to invade Bahrain to settle things down in the Middle East. Yep, I'm sure that will calm those protesters right down. The financial story of the day tomorrow might end up being the rumored leak of data implicating Bank of America of serious fraud related to their mortgage processes. This seems to be a pretty serious rumor and it seems like someone might make good with the details that Wikileaks could only allude to. * Bank of Japan increases their injection of money to 12 Trillion Yen ($147 Billion) - they initial estimate was 2 Trillion Yen. * US helicopters are reporting radiation levels 60 miles off the coast of Japan. * The Middle East is still simmering. Oil is pulling back a little today, but remember Fridays have been very volatile after Friday prayers. * Technical analysts are seriously sweating the 1300 level in the S&P 500. If it breaks through (and holds below 1300) the next stop on their charts is almost 10% lower. I don't subscribe to this thinking but many people do so we have to be aware of it. * GM's CFO is resigning and GM's stock is now solidly below their $33 IPO price. A slowdown in China would have a huge impact on GM. The old saying was "What's good for GM is good for the US." The new saying should be "What's good for China is good for GM." * The most staggering data point from the Initial claims report was that the number of people on unemployment fell from 9.24 million to 8.77 million a decline of nearly 440k people in a week. Did they all get jobs last week? This seems highly unlikely, but with nearly 150k people coming off the extended unemployment rolls I'd guess it's simply a matter of benefits running out (remember the worst of the recession was around 99-100 weeks ago - Feb 2009 -and those that have had 99 weeks of benefits are now coming off the unemployment rolls). Maybe there is a correlation between the spike in local bank robberies and the expiration of unemployment benefits? * The most comical data point of the day comes from the US/China trade statistics. China says their US surplus was $13.6 billion (they sent $13.6 billion more of goods and service to the US than they bought) but the US says our trade deficit with China was $23.3 billion. That's a pretty interesting spread. I like to consider myself a fairly savvy shopper when it comes to booking travel. I set fare reminders at all of the best aggregators (kayak and farecast are particularly good) and when I see a good airfare I pounce on it. Hotels can be a bit trickier especially in destinations that are popular with global tourists (Miami, Hawaii, Cancun, etc) because their currencies have bee so strong compared to the dollar that they are able to pay daily rates that seem criminal to a tightwad like me. Sites like VRBO offer some relief and traveling outside of the normal dates (don't leave on the Saturday of Spring Break) can improve your odds, but finding an affordable, high end hotel is very challenging right now. However, there was one issue that always drove me crazy (pun intended) and that was car rental. A week ago I looked at car rental rates in Florida and I could have had any car I wanted for $15/day. Last night that had jumped to an average of $100/day. I did all of the normal computer tricks (clear history, clear cookies, etc) but the rates were still in the high $90's per day. Just a side note on the importance of clearing your cookies and history when it comes to travel. Hotels have really figured out how to track your visits and move their availability and pricing to entice you to purchase. One hotel I was watching went from having every room available to being practically sold out over the course of 3 visits. After I cleared my cookies, the hotel magically became empty again. For the uninitiated you can clear cookies by clicking tools in Internet Explorer, click Internet options, click general and click "delete" under browsing history (just make sure your cookie box is checked). Anyway, back to car rentals - I read a tip suggesting that one should look at rentals off the airport. Apparently rental car companies know that the average person doesn't think to look for a rental anywhere but the location where their plane lands and they charge accordingly. I changed my search protocol for a trip to Florida from pick-up "at the airport" to "city" and guess what happened? A full-size sedan for $40/day was available from Hertz at a location 5 miles from the airport. I'll gladly hop in a cab for $15 ride to save $500 on my car rental. Hopefully, you're able to use some of these tips to save some cash on your next trip south. So, there's a new, free mass transit system that has been developed by citizens in Washington without aid of billions of dollars in stimulus money, years of consulting studies and 37 layers of administration. The only thing it needs is a better name than "slugging". Thousands of commuters in Virginia are looking for a faster way in and out of DC via the precious HOV lanes (high occupancy vehicle lanes). What's really stunning to me is that this is entirely voluntary and seems to be a grassroots movement that has sprung up in the motherland of all bureaucracies. "Every morning, these commuters meet in park-and-ride lots along the interstate in northern Virginia. They then ride, often in silence, without exchanging so much as first names, obeying rules of etiquette but having no formal organization. No money changes hands, although the motive is hardly altruistic. Each person benefits in pursuit of a selfish goal: For the passenger, it’s a free ride; for the driver, a pass to the HOV lane, and both get a faster trip than they would otherwise. Even society reaps rewards, as thousands of cars come off the highway." Slugging — The People's Transit from Miller-McCune on Vimeo. The best quote from the video: "It's like chaos but it actually works." We don't have a need for HOV lanes in NNY but I could imagine a modified slugging model working as a way to lower commuting costs if gasoline prices stay above $3.75. There are a few central hubs for employment in NNY - Watertown, Ft. Drum, etc. - and individuals commuting from all over the North Country to reach these destinations. An individual working on Fort Drum and living in Clayton has a weekly commute of 300 miles. Assuming 20 miles/gallon you're looking at 15 gallons of gas or $60/week in commuting cost (I used $4 gas just to make the math easier). Split that cost with 3 other people driving from Clayton to Fort Drum every day and your annual commuting cost might fall from $3,000/year to $750. Congratulations you just saved $2,250 in after-tax dollars or over $3,100 in pre-tax money. You just gave yourself a 5% pay raise!! Perhaps someone should set up a Facebook page or blog recommending pick-up points/drop off spots in Watertown/Ft. Drum. For your daily dose of comedy please consider "License center can't offer licences because they didn't get their license." "When Farmington opened a license center at city hall about a week ago, officials thought it would drive more people downtown. Turns out the city-owned center couldn't help residents drive anywhere, because it failed to get state approval to offer driver's license and motor vehicle services. " One of the constant refrains we hear from politicians and pundits is that we just need to focus our energy on creating an educated workforce and the US economy will turn the corner. However, a couple of recent stories seem to throwing water on that concept. Consider "Lawyers replaced by software"
"In January, for example, Blackstone Discovery of Palo Alto, Calif., helped analyze 1.5 million documents for less than $100,000." "New jobs, he says, are coming at the bottom of the economic pyramid, jobs in the middle are being lost to automation and outsourcing, and now job growth at the top is slowing because of automation." The continued evolution of increased computing power may eventually impact the professional jobs in the US. I was struck while reading the February issue of Conde Naste Traveller how hard it must be to publish a static document like a magazine in today's rapidly shifting world. For example, listed among their great getaways for the month were trips to Tunisia, Libya and Egypt. Why not add Iraq and Afghanistan and make it a war torn world tour? The best line is in the subtitle of the Cairo article "I inhale the vastness and the calm." While we're stressing over $3.75 gas in the US, pause for a moment to reflect on the fact that gas in Europe is now averaging $8.63 per gallon! Wow. Anyone who drives to work, who eats food that isn't local grown, raised or canned, travels or buys pretty much anything that has to be shipped is seeing the sudden effect of the rise in crude prices. Here is my quick and dirty breakdown of the crude oil situation globally. * The world has lost access to about 1/2 of the daily shipments from Libya. * This represents only about 1% of global supply. * Every dollar rise in the price of crude oil adds about 2.5cents to the price we see at the pump. * Every penny increase at the pump is effectively a $1.5 billion additional "tax" on US consumers. * The 33 cent jump in gas prices over the past 2 weeks will subtract about $50 billion from the wallets of US consumers if it holds. * There have been 5 occasions where the price of crude oil doubled in less than a year. Four of the five times, the doubling of oil prices led the US into a recession (the one exception was 2005 when we were in the midst of the housing bubble). Oil prices have now doubled again in less than 2 years for a 6th time. Will this lead us back into recession? 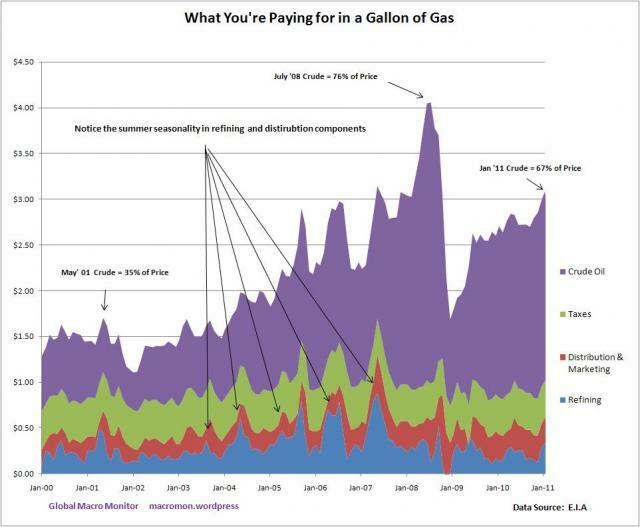 Below is a chart highlighting the cost of a gallon of gasoline and it's component pieces. What is really startling is that since 2007 we've only had one brief period where gas prices dipped meaningfully. Other than that, we've been (un)comfortably above $2.50 for most of the past 4 years. Here's one of the problems with this sudden surge in oil -- there's actually plenty of oil to go around right now. US stockpiles remain high and the global supply remains mostly intact. However, as we saw last time oil prices spiked, we may have to blame the speculators. "The Crude Oil non-commercial net specs are at an all time high: well over 100% more than during the oil time highs in crude in 2008. This means that speculators are anticipating an even more powerful move higher than that seen in the summer of 2008 when Crude hit $150." "My biggest concern about the oil complex is not necessarily total supplies but rather the increased levels of speculation that could take place in the oil markets. As money chases oil, the price could continue to escalate despite improvements in supply." This appears to be the situation today. 1) Bahrain - Rumored settlements between the Shia rebels and the ruling party could set up more important protests Kuwait. That could eventually spark more protests in a country that rhymes with Fraudi Marabia. 2) Speaking of Saudi Arabia, the talk coming out of that country will be interesting leading up to March 11th and March 20th. There are plans for some type of revolutionary protest on March 11th in the Shia province in the Northeast portion of the country. Saudi Arabia will do everything in their power to maintain the status quo and they have banned all protests in the country. Whose side will we take in this battle - the Sunni's that keep the oil flowing or the Shia protesters? 3) Watch for talk that the US will tap our strategic petroleum reserves. This normally has the desired effect of calming energy markets but since we can only draw a maximum of 4 million barrels/day out of reserves and we are using 21+ million barrels per day the impact of tapping our reserves could be limited. Cheers and good luck finding gas in the $3.60 range! I was early on the outsourcing bandwagon and actually wrote my first piece of Wall Street Research on the coming wave of outsourcing over 15 years ago. Over time we've seen outsourcing grow from corporate phone centers to include relatively high levels of research and development. I read this opinion piece from the Guardian today and I have to say that I tend to agree with his theory. The future for western citizens looks increasingly dim because corporations are embracing a new model that allows them to keep 10-15% of their best and brightest domestically while outsourcing or using offshore employees to handle every other level of corporate activity. I think this is a remarkably short-sighted approach because you can not train the next generation of leaders for your firm if you gut the entire mid-level management and research of your company, but this apparently the model that most companies are now pursuing. Much of this shift is happening underfoot without many western citizens being aware of the shift. While, I agree with many of the points made in this opinion piece, I'm equally disturbed by these trends. Maybe I should forget saving for college and instead just buy land in Hyderabad with the kid's college fund. "Knowledge work", supposedly the west's salvation, is now being exported like manual work. A global mass market in unskilled labour is being quickly succeeded by a market in middle-class work, particularly for industries, such as electronics, in which so much hope of employment opportunities and high wages was invested. As supply increases, employers inevitably go to the cheapest source. A chip designer in India costs 10 times less than a US one." But now the middle office is going too. Analysing X-rays, drawing up legal contracts, processing tax returns, researching bank clients, and even designing industrial systems are examples of skilled jobs going offshore. Even teaching is not immune: last year a north London primary school hired mathematicians in India to provide one-to-one tutoring over the internet. They assumed "knowledge work" would always entail the personal autonomy, creativity and job satisfaction to which the middle classes were accustomed. They did not understand that, as the industrial revolution allowed manual work to be routinised, so in the electronic revolution the same fate would overtake many professional jobs. Many "knowledge skills" will go the way of craft skills. They are being chopped up, codified and digitised. Every high street once had bank managers who used their discretion and local knowledge to decide which customers should receive loans. Now software does the job. Aspirant graduates face the prospect not only of lower wages, smaller pensions and less job security than their parents enjoyed but also of less satisfying careers. True, every profession and company will retain a cadre of thinkers and decision-makers at the top – perhaps 10% or 15% of the total – but the mass of employees, whether or not they hold high qualifications, will perform routine functions for modest wages. Ugh, time to get some prozac. The jobs number was just about inline with expectations. Pretty significant upward revisions to Jan and December data. The only fly in the ointment is that pesky Birth/Death adjustment which added 112k jobs to their the BLS black box model (we are never told what impact the birth/death number has on the final number so we can just look at it and wonder). I wish all of these people the best of luck but I think it will be challenging for many of them. I think the local economic development authority has been very successful in showing people the ease with which you can start a business (which does directly impact the government's jobs creation data). Running a business successfully is another story. So, here is the trouble with this report. If this jobs report is a true reflection of the economy then the Fed should cease all stimulative activity because clearly the economy is recovering. However, the Fed seems to be of the opinion that the economy is not recovering or else they wouldn't be going full throttle with their current round of easing and hinting at more easing later this year. Something doesn't mesh between this report and other data points in the economy, but this is the data that will drive the news cycle for the next 3 days. Well, here it comes. At 8:30 we'll get the latest take on the economy and since it didn't snow in February this number should be off the chart. Despite record levels of food stamp participation, rapidly decline household employment participation and increasing layoffs, the expectations for this number keep growing. The consensus is almost 200,000 jobs and the whisper number is probably well above that. Yesterday's move up was largely based on expectations of a blowout number today. I'll update further after the info hits the BLS website. If the reporting in this story wasn't so sound I'd be very skeptical, but I suppose it is possible that our military is spending millions to create fake online profiles. I know that automatic profile generating software exists because when you search twitter or facebook for certain terms (imagine a hot product like p90x DVDs) you get a pile of profiles that are all virtually identical with minor tweaks to them. Apparently, the military thought that there might come a time when they would want to control a message. For example, imagine 1 million angry facebook users complaining about human rights in your country, what if you could counter that with 10 million computer generated profiles that are pro-government supporters? Perhaps you can stem the tide and change the public's perception. Unfortunately, we're not talking about China, Iran or Saudi Arabia pursuing this plan, but rather our own military. "Raw Story recently reported that the US Air Force had solicited private sector vendors for something called "persona management software." Such a technology would allow single individuals to command virtual armies of fake, digital "people" across numerous social media portals." These "personas" were to have detailed, fictionalized backgrounds, to make them believable to outside observers, and a sophisticated identity protection service was to back them up, preventing suspicious readers from uncovering the real person behind the account. They even worked out ways to game geolocating services, so these "personas" could be virtually inserted anywhere in the world, providing ostensibly live commentary on real events." Ah, the banks are always on our side right? As part of the Wall St. Reform and Consumer Protection Act there is a clause that would limit debit card transaction fees to just $0.12 per transaction. Obviously, this is a win for consumers right? Ah, but the banks are already one step ahead of the legislation and they are considering instituting limits for debit card transactions to just $50-$100. Anything above that and they will say "Nope. We know it's your money but we're not getting paid sufficiently to hand it over to you. Please use your credit card." The thinking there is that while debit card fees were capped at $0.12, credit card fees (charged to the seller) are now anywhere from 2-5% of the total transaction cost. Buy your groceries at Wegmans for $164.19 for the week with a debit card and the bank gets $0.12. If they cap debit card use at $100 and you have to use your credit card, the bank might earn $3 to $8. The higher fees wouldn't be readily apparent to the end consumer but eventually it will translate into higher prices as retailers pass along their higher costs. Much like the bike registration issue, I'd expect such a substantial backlash that it would prevent this from becoming an actual industry standard. So while the US foreign policy team has stopped, started and stammered it's way through the Middle East/North Africa revolutions, the markets have soared this morning on a rumor that Hugo Chavez of Venezuela (yes, that Hugo Chavez) has stepped in to broker a deal. Oil is down and stocks are up around the globe because Chavez appears to be working some sort of backroom negotiations. I don't believe for a second that the protesters in Libya are planning on negotiating a settlement, but this is what the market believes right now so it makes sense to plan accordingly. *** If you linked in looking for the bike registration article just scroll down a bit. Thanks for visiting. On a related biking issue check out this unbelievable helmet cam footage of a downhill bike race in Chile. That guy (or girl) has unbelievable bike handling skills but in NY he'd have to have his bike inspected every year if some politicians had their way. *** If you linked in looking for the story on the Bike registration fee just scroll down a bit and thanks for visiting. Del Monte has come up with individual plastic packaging for bananas, a fruit that already comes in its own natural, biodegradable wrapper. The packaged bananas are also expected to be more expensive, at about $1 (U.S.) per fruit, the Daily Mail says. Individual bananas wrapped in plastic? Brilliant! I thought it might be timely to revisit one of last year's biggest stories in the US markets - GM's IPO. If you remember GM launched their IPO at $33/share and after days of flirting with that IPO price the stock eventually shot up into the upper $30's and seemed to have survived to fight another day. Fast forward a couple of months and Detroit, we might have a problem. The stock has been fighting hard to maintain a level near $33 (the end of day buying to prop the stock has been very evident) but has now closed two days in a row under the IPO price of $33. Eventually, this will trigger some computer sale programs and that's when things get interesting. Bloomberg reports that "General Motors Co. is offering buyers interest-free financing on some 2011 models after the company increased discounts and incentives to lead all major automakers’ U.S. sales gains last month. "GM raised discounts 12 percent from a year earlier to an estimated $3,732 per vehicle last month, the most among major automakers and 45 percent more than the average, according to researcher Autodata Corp."
Coupled with Consumer's Report panning of the Volt this week --- The magazine’s team got between 23 and 28 miles in battery-only range because of the cold weather. (General Motors says the Volt can go 25 to 50 miles on its battery.) After that, the gasoline generator got about 30 m.p.g., compared to the Environmental Protection Agency rating of 37 m.p.g. --- makes one wonder what the future holds for GM. Just when you thought it was safe to help the environment and get some exercise at the same time, an Assemblyman from Queens has proposed a bill that would require bike registration and inspections for all cyclists in NYS. "a proposal by assemblyman Michael DenDekker, a Democrat from Queens, which would require by law that every bicycle -- not just in New York City, but in New York state -- have a license plate and to be re-registered every year only after an inspection of the bike. A second bill would require every commercial cyclist in the state to carry identification and have insurance; their initial registration fee would be $50." The straw that finally breaks this camel's back - priceless. Now, I'm biased because I'm a cyclist and I have a cycling family, and our 6 bikes would cost a pretty penny to register. Just this past weekend I was raving about how I'd beat the system by installing ice tires on my mountain bike which allows me to tow my ice fishing sled anywhere without incurring the cost of buying, registering and insuring an ATV. So much for beating the system. But why stop here? I know there are hundreds, if not thousands of jaywalkers threatening our very existence darting in and out of traffic. I think the fine Assemblyman from Queens should call for registration of all walkers in NY State along with a licensing fee of $12.50 for each pair of shoes you own. Perhaps we should inspect those shoes annually to make sure they are still safe to operate (a small $5 fee/shoe could be implemented). Maybe we could even install modified red light cameras to catch the perpetrators in the act? Relates to the annual registration of personal bicycles and provides for a license plate fee of twenty-five dollars for the first year and five dollars for every year thereafter. *** Update, so after speaking with our the office of our local Assemblywoman, I have a sense that this is bill probably not moving forward because it is a single sponsor, single house bill (meaning it doesn't have a similar bill in the Senate). I feel better after that conversation that this is probably not a serious piece of legislation. Only in NY my friends. The MTA hasn't finished a new subway communications network - and it's already out of date. The Metropolitan Transportation Authority started the $370 million fiberoptic, information-carrying network in 2000 and expects to finish it this year. But technological advances and hundreds of budget-busting, time-consuming changes have pushed the project $76 million overbudget. "Due to technology evolution and other factors, many components in this network are at or nearing their end of life," an MTA document from October says. So because it has taken nearly 10 years to install this plan, the technology is already obsolete? Brilliant use of MTA funds. Only on Wall Street could you devise a plan to trade something that no longer exists. "Banks and hedge funds are trading credit-default swaps, which make payments to holders of General Motors bonds in the event of a default. But GM canceled $40 billion of debt in bankruptcy and has pledged to cut its remaining $4.6 billion bank loan to the bone this year. That is merely a technicality for the banks and hedge funds that have been actively trading the CDS." "Sure, having CDS without debt looks odd, and people may balk because credit derivatives were at the center of the AIG collapse, but that doesn't change the fact that CDS prices are the de facto benchmark used to measure the state of the credit market," said Kevin McPartland, senior analyst at research firm TABB Group." I'd like to buy some dodo bird futures and sell some T-Rex March 2015 calls. Do you think Goldman could make a market in that? New Jersey workers scared into retirement? "More than 20,000 police officers, firefighters, teachers and other public employees put in their retirement papers last year as momentum was building for sweeping health and pension reform in Trenton, state figures show. That is a 60 percent jump from 2009 retirements and the highest in at least a decade, according to the Division of Pension and Benefits." Retirements among police and fireman jumped 45% while teacher retirements jumped 95%. This is a bit misleading however, because retirements dipped in 2009 (in the heart of the recession) and have rebounded above previous levels so it looks like a giant jump in the rate of retirement.